Recipe submitted by Pamela M. Peeke, M.D., M.P.H., F.A.C.P., Speaking of Women's Health 2007 Keynote Presenter. 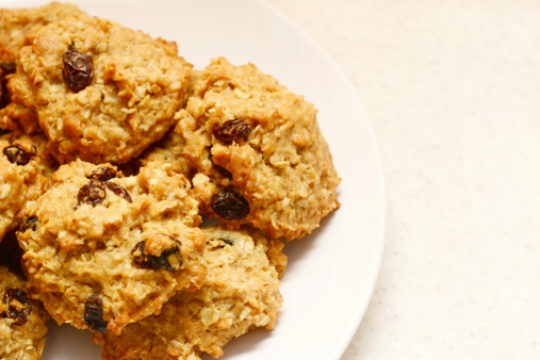 These oatmeal cookies are a healthier option for an after-school snack! They’re low in calories, but high in flavor. Kids will love the smell of cookies warming on the baking pan as they step inside after a long day of school. These oatmeal raisin cookies can even be packed for lunch the next day, if they last that long! Lightly coat a baking sheet with canola oil. In a large bowl, combine butter, cream cheese and brown sugar. Add egg yolk and vanilla extract and mix briefly. Combine remaining ingredients in a large bowl. Add to creamed mixture and mix until all dry ingredients are moistened. Portion heaping teaspoonfuls of dough, about 3/4 ounces onto baking sheet about 1 1/2-inches apart. Bake for 7 minutes. Lightly flatten with finger. Rotate baking sheet and bake for 4 minutes.